They didn’t know I was taking a picture with my phone. Dave could not find his shoes and had to wear his Dad’s big white size 13s into the store. We stopped at Barnes and Noble at about 7:30, on our long-long drive home from Georgia. Rich and I lined them up on the curb so we could give instructions and information to everyone at once, rather than 6 times (forgetting the seventh, which is typical–SOMEONE gets missed!oops). The instructions were: 1. Everyone needed to use the bathroom. 2. Everyone may pick out something to read. The news was: 1. We were driving all the way home without stopping at a hotel to sleep. We arrived home early this morning at 4:30. My favorite memory of traveling was at about 2 in the morning when they had taken little naps, gotten over the grumps, and had a second wind of cheer. Singing to the radio, telling funny stories to classical music, watching a video. At 2 a.m.!! Such good little travelers. Rich singing every hymn he could think of to himself while flying down the highway in the fast lane……me half enjoying it and half plugging my ears so I could concentrate on my new cheap paperback. Hanging on and whispering prayers. Rich, by the grace of God, is raising up some good young men. This is our Ethan. He loves Jesus, being active, sports. He doesn’t talk much. He can dance some cool moves. 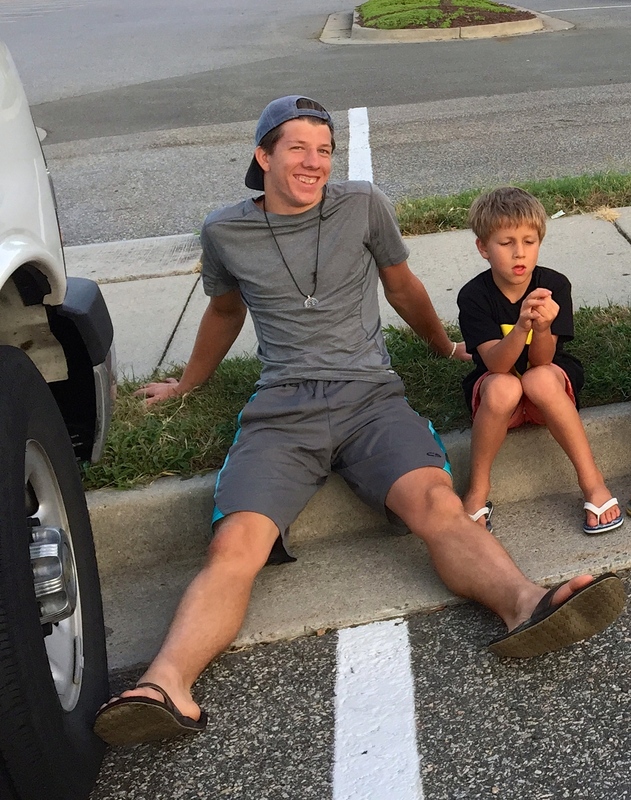 He is confident, respectful, honest, and doesn’t take any slack from his younger siblings. My favorite memories of Ethan from vacation are 1. When he pulled himself up over a high wall to retrieve the volleyball we had hit way out of bounds. and 2. When he walked out of McDonalds holding Seth’s hand on one side and Sarah’s on the other. Be still my heart. My mom loved vacationing with all of her children and grandchildren, but she was itching to get back to her garden. I’m just like her. My garden is much smaller but the first thing I did today after I woke up at 11am was go outside with my cup of coffee. I knew where to find some treasures. Some were obvious, like the bright red tomatoes. But others, like the cucumbers and green beans, were hidden and had to be searched out. For brunch I made a quiche. Bake in the oven for about 25 minutes or until set. I served it with the rest of the garden tomato, mixed with salt, olive oil, onion, and basil. I almost shrieked when Tessa told me school started this Thursday. I thought I had one more solid week with the children. My heart aches because Sarah Joy is going off for her first day of Kindergarten. Mothers understand what I mean….I’m happy for her, I know she’s ready, but as a mom I feel that small sad-like feeling of letting go. Rich read Seth and Sarah letters from their teachers, which were in the mailbox when we got home from vacation. Their little faces were seriously listening to every word. They have homework to do, and a meet and greet on Wednesday. I don’t quite feel ready, but I’m thankful for this journey with my children and that little by little they grow up, not all at once. Thankful for Jesus and for my husband making it easier. 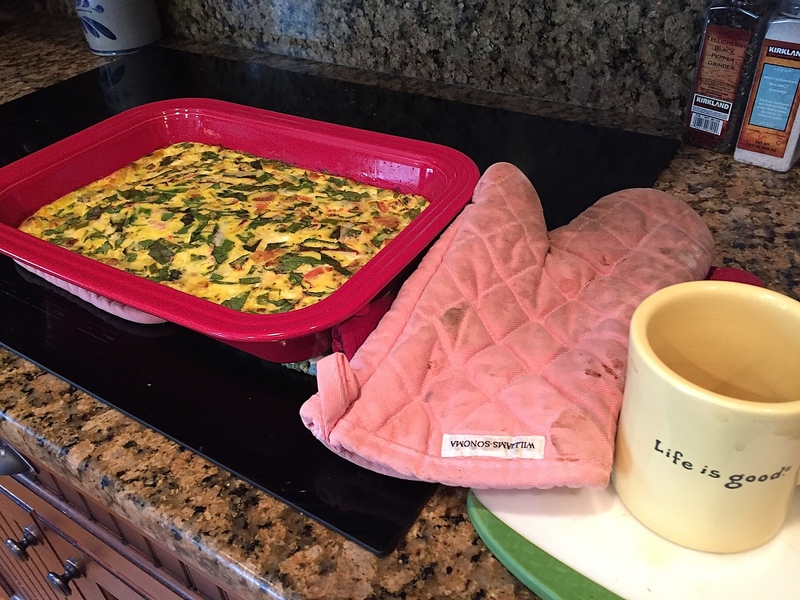 This entry was posted in a simply lovely life, family, life with boys and tagged faith, large family, mothering, myhusband, recipe by Shanda. Bookmark the permalink. Amen. I do understand. Mom’s have to have a strong heart. Lol. I’m so thankful jesus loves and sees our kids at school. As always a post that lifts my heart! Your veggies and fruit are amazing and a blessing. I bet they all taste so good compared to store bought. So nice seeing pics of your vacation too. Blessings for a wonderful school year for all the children. Jill, thanks for following along with my blog and for enjoying it! It makes posting so much fun! 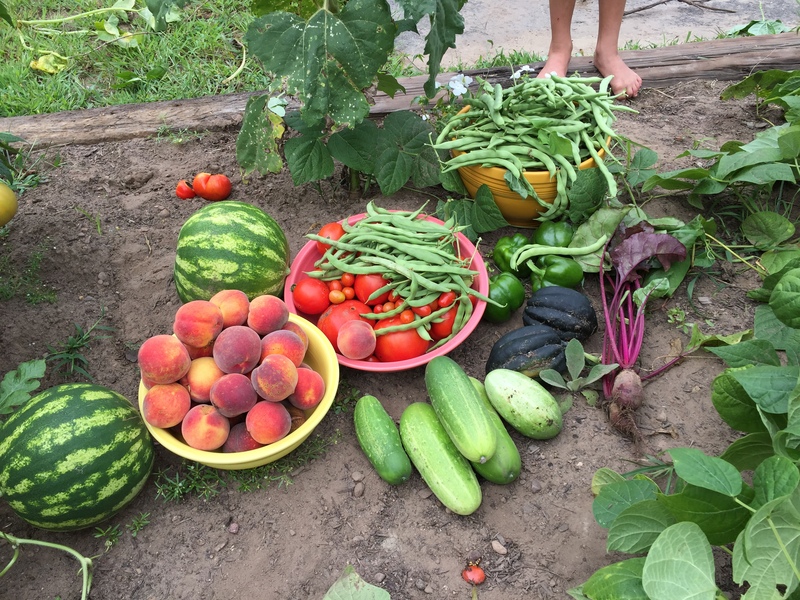 The fruits and veggies are delicious, I think even more so because I grew them. Especially the peaches. I’m still amazed that we planted that tree and it’s producing for us. Thanks for the school year blessings! Sarah told me this morning that she’s so excited she wants to pinch herself. So glad that you made it home safe and sound. It sounded like a wonderful vacation full of many great memories. Thank you! 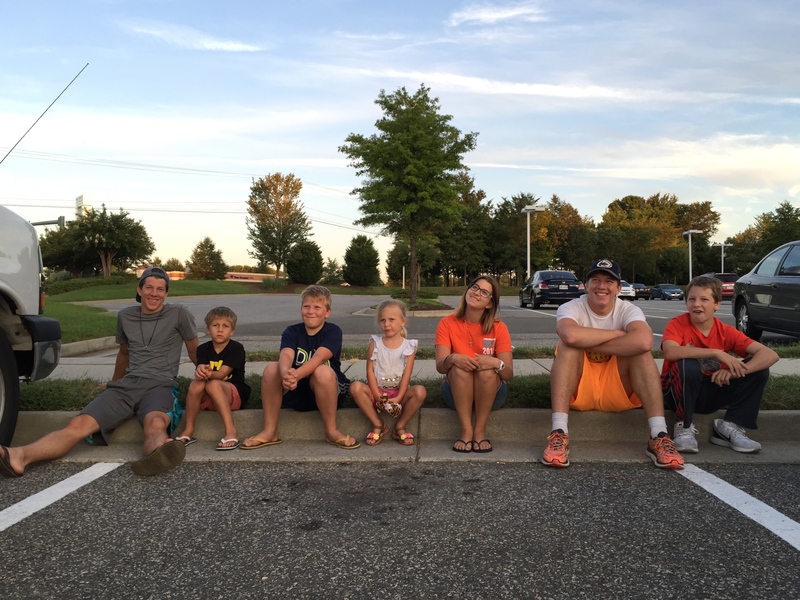 It’s always a relief to get home safely after a long drive…and to think over all the good memories from vacation! Blessings to you this day! I love how you feature different children at times. Love the big smile on Ethan. You and Rich are raising up great children for this world that needs the Lord. My your garden did well! Isn’t it the best? Bob is over watering this evening and I told him to check for green beans and tomatoes. I forgot to say cucumbers too! Hugs for you mama, I know later this week will be a bit emotional, but you can fuel up for the afternoons and evening.